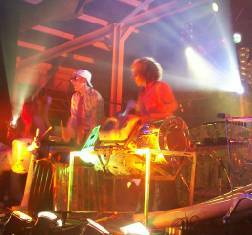 Big Beat are the most innovative and original purveyors of junk-percussion music and their energetic funk-fuelled performances make them one of the most exciting festival acts of the millennium. Big Beat produce incredible sounds on a multi-coloured array of industrial waste - including gas pipes, kitchen sinks and plastic barrels. 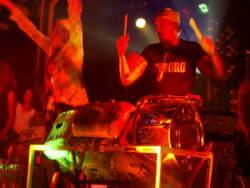 Audiences are instantly engaged and amazed by the infectious beats. It was a pleasure to work with such an enthusiastic and helpful bunch of people. I would have no hesitation in inviting Big Beat back again or recommending them to others as a value for money fun act. Visually fascinating and energetic, the performances never cease to amaze and are suitable for street festivals and stages of most sizes. Whether outdoor or indoor, acoustic or booming out through a PA, a set (or few!!) by Big Beat can add the WOW!! factor to your event. The best thing at Glastonbury!!!! Big Beat rocked the festival, definitely the best act there by a long, long way. Big Beat have honed their festival performance skills over the past 10 years - chalking up over 2000 gigs in the UK and worldwide - including festivals in Portugal, Israel, Holland, France, Belgium, Ireland and Germany to name but a few!!. Consummate festival performers, we are looking to bring our own particular brand of junk-funk percussion and magnetic audience participation to festivals new. Big Beat - what can I say? The biggest , brightest, loudest "junk-funk" explosion to hit the streets of Waterford. As dynamic and engaging as ever, our performances remain unequalled in terms of visual energy and the magical impression left on varied audiences. We believe we are the ultimate festival act - dynamic, fun, unforgettable and flexible.